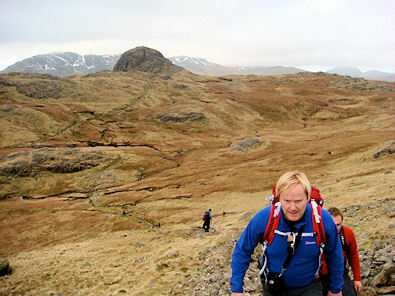 Summary: John Deasey has devised a superb walk by linking iconic Bowfell to the Langdale Pikes. 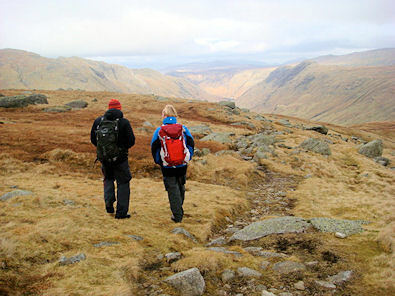 This is a brilliant route resulting in an awesome walk but bear in mind before taking this one on; it is a tough hike with over 1,300 metres of climbing. Neal and I were joined today by Steve and SDC. 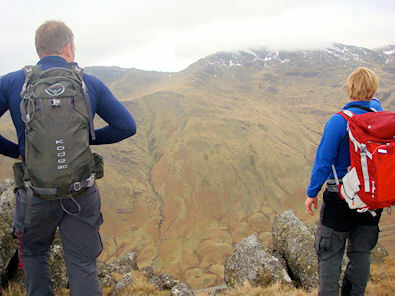 Steve had heard us go on about the delights of the Lakes and the stunning views on offer. We decided to ascend Bowfell via the Climbers Traverse followed by a tour of the Langdales would just about be perfect and as the forecast was set fair we left New Dungeon Ghyll car park bang on 7:30am with the full expectation that the clouds hugging the valley would soon clear. 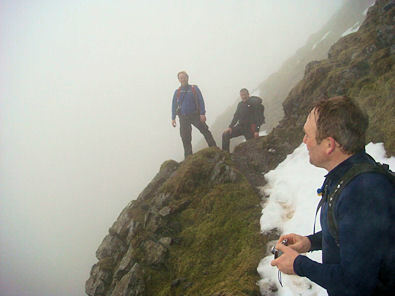 After a gentle warm-up to Stool End Farm, the climb began in earnest up the Band. The early morning light and the brooding clouds gave a very moody atmosphere and we kept promising Steve that everything would be clear by the time we got to the Climbers Traverse and that the views would be incredible. 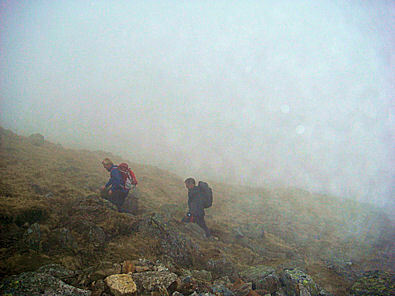 As we climbed, the clag got worse. As we got higher, it got thicker. As we got to the Climbers Traverse you could see about five yards! All along this thrilling path we kept telling Steve how good the views were, how there was a terrific view across to Pike of Stickle and how stunning the cliffs above us were - we could just about make out our hands in front of our faces at this point so he was a bit sceptical about the whole thing. Anyway, after a fairly dodgy section on the Climbers Traverse with hard ice and snow at a 45 degree angle, we got to the Great Slab. It was so iced up we had to scramble the boulder field to one side which was hard going as we had decided crampons wouldn't be needed today. As it turned out, we would only have required them for 100 yards or so, so no big deal - and it made us feel more adventurous. 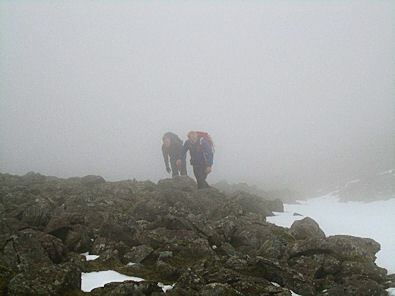 On the top of Bowfell we pointed out all the highlights to Steve including the Scafells, Crinkle Crags etc, all the while looking at a blanket of fog just inches in front of us - so far, not so good. Fortunately things were to improve. 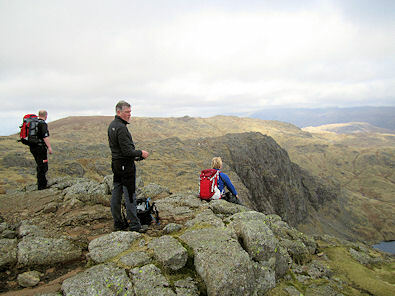 We navigated confidently off Bowfell summit and headed for Ore Gap with the intention of going up to Esk Pike then around Esk Hause back to Angle Tarn. As the clag refused to clear, we diverted off the intended route and dropped down the steep boggy path directly from Ore Gap hoping to arrive at a fog free Angle Tarn. 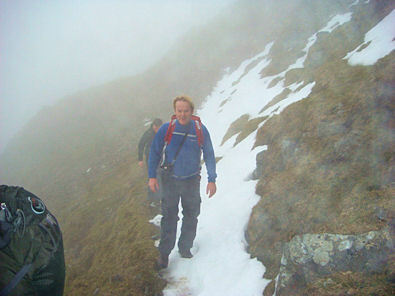 The clag was stuck to us and followed us all the way down the very steep slope. In fact, it was stuck so closely to us we hardly even saw the tarn until we were next to it. This was getting a bit daft now as we had just descended several hundred feet to get in clear air. 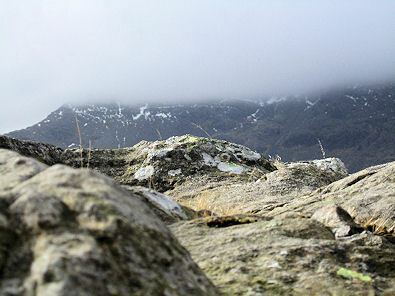 We located the next path which would take us over Rossett Pike and along what should be a fantastic ridge walk around Black Crags to Langdale Comb, and at this stage we were getting a bit fed up with the mist, cloud, clag and crap that refused to lift. 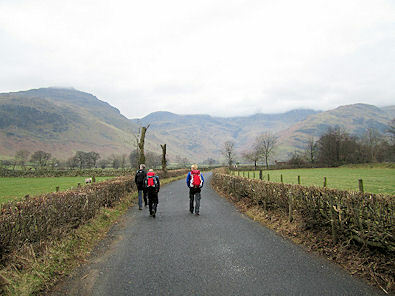 However, as we approached Langdale Combe we suddenly could see right down onto the Cumbrian Way and Stake Pass and the clouds started to roll back to reveal stunning views in all directions - Steve was happy now. In fact, looking back to Bowfell we could clearly see the Climbers Traverse with a line of snow where we had been an hour ago and it looked very impressive. 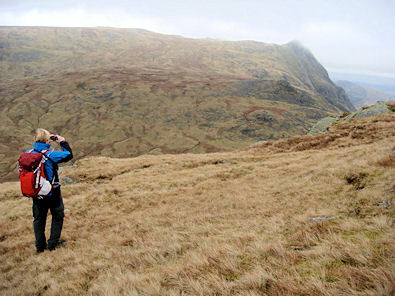 Our next target was in view - Martcrag Moor . It was fascinating looking down from such a height at the moraines of Martcrag Moor - these are not monsters, but the small hummocks left from the glaciers departure. A quick lunch stop as the clouds moved away lifted our spirits and we set off for the next stage of the walk in good heart. 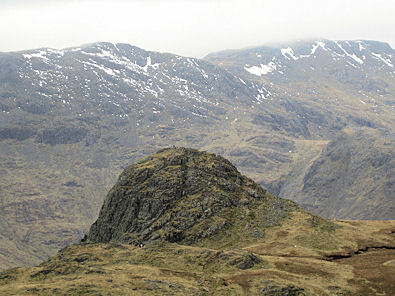 A lot of work has been carried out on the paths here over recent years as it is a very boggy place and it was bit of a trudge up to be honest., despite the good paths, but all was forgotten as soon as we saw the distinctive summit of Pike of Stickle coming into view. The approach from this angle is very deceptive as it gives no clue to the drama and the elevated feeling you get from such a commanding, yet from this angle, innocuous, peak. 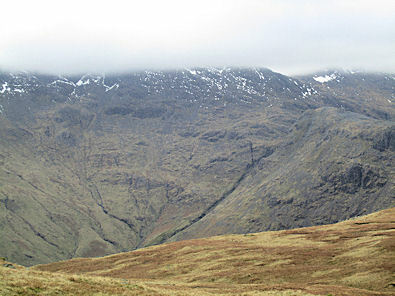 An easy scramble up and we were standing on one of the best viewpoints in the Lakes looking directly into the heart of Rossett Gill with the brooding presence of Bowfell commanding the whole scene. 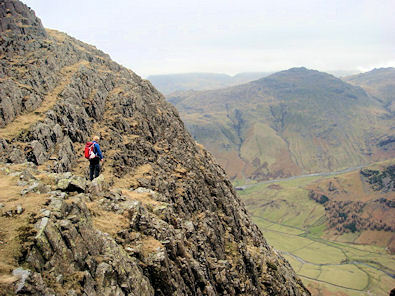 Looking back to Pike of Stickle - notice the man on top? Much nonsense was talked on the summit as usual and there was the usual comedy moment with cruel jokes being made about my ineptitude with a camera. Several shots turned out to be just sky, one was off a sheep foot and one seemed to be just the ground in front of me. David Bailey can rest easy but the other lads tell me they are experts with the camera so I leave most of that stuff to them. (Fortunately the Walking Englishman has taken my advice to not show my camera expertise here!! All photographs are provided by my more camera astute friends) We had a quick peek down the scree gully just off Pike of Stickle and meandered about for while enjoying being amongst such magnificent scenery. 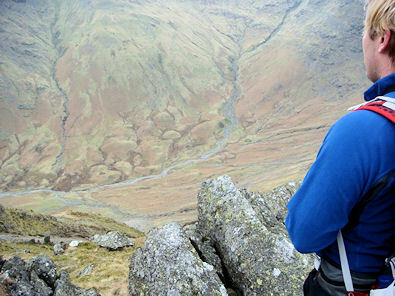 A short descent to the top of the Dungeon Ghyll path then gave us our last climb of the day up to Harrison Stickle. From the summit the views down to Pavey Ark and Stickle Tarn are always good and today was no exception with the air becoming very clear. 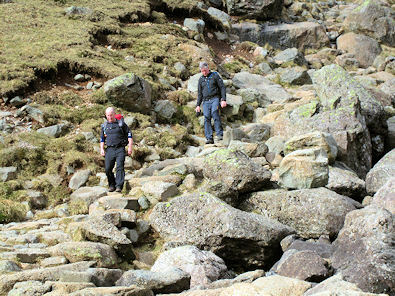 John and Steve on Stickle Ghyll path in sunshine! We had intended to go round to Pavey Ark to finish off but the lure of a good pint of ale tempted us down off the mountain like the sirens on the rocks sending a ship to it's doom ...... besides, we had covered good ground, had gone up some good climbs and done pretty well considering the first couple of hours were in terrible visibility. 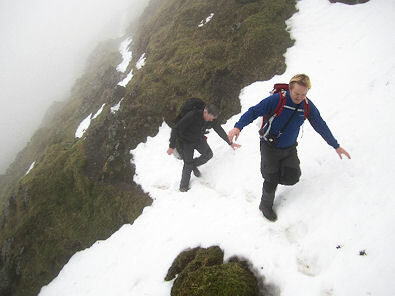 The descent off Harrison Stickle can only be described as steep - very steep. I love going up the hills but hate coming down but Neal and SDC enjoyed this bit and romped down like two 12 years olds whilst I stayed with Steve and enjoyed a much safer and slower descent. 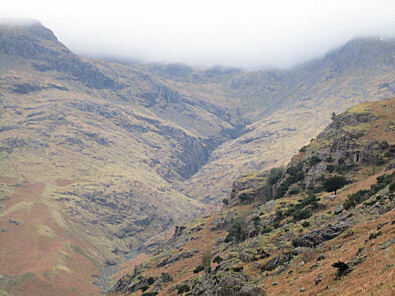 We re-gathered at the foot of the mountain and relaxed over a very enjoyable pint in the New Dungeon Ghyll - a grand day out as you might say.